Los Angeles is the home of many things, including a staggering assortment of burgers. It’s the land of brioche, slow cooked onions and mountains of arugula, gourmet prices and sous-vide meat. Which, barring this town’s obsession with brioche, I normally love. But sometimes you just want a no-frills burger. A simple, rugged sandwich made with a vertical genius. And that is where The Bowery shines. It serves up a polarizing burger reminiscent of backyard BBQs that is both decried and lauded on the internet. And frankly, I get it. It’s served on an English muffin. It’s missing the kiss of hickory that Apple Pan fans love and the combo of squishy crunch that Pie n’ Burger offers (which, besides The Container Store & the flea market, is the only reason to go to Pasadena). But it’s good. It’s a thick, hockey puck of grass-fed beef, full of juice that soaks the bread and is best served medium rare. The little sheaf of butter lettuce, single (small) slice of tomato and cornichons on the side serve to remind you’re just here to eat ground beef. Sure, you could get confit red onions as a topper, but why would you? This is a burger best left in it’s a natural state. Though, if you’re feeling the need to decorate, a blanket of melted cheddar makes everything better. Order it with mashed potatoes on the side for true perfection. 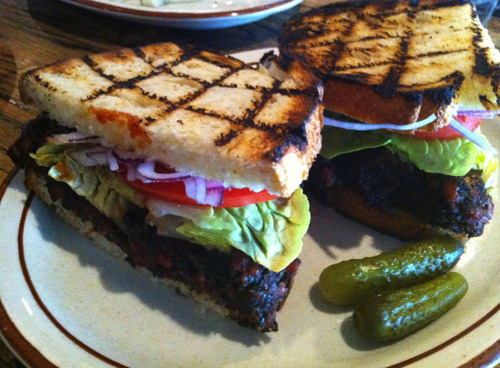 For those of you on the veggie end of things their grilled cheese sandwich is gorgeous (and spicy) and the vegan burger is a delicious mess of beets, spice and charred bread. Have a hangover or still drunk and not willing to embarrass yourself trying to eat like a person? The gravy fries (with brisket!) are perfect—as is the Bowery’s beer menu.